A Miramichi police officer who drove more than 70 kilometres an hour above the speed limit answering a shoplifting call has been found guilty of dangerous driving. Const. 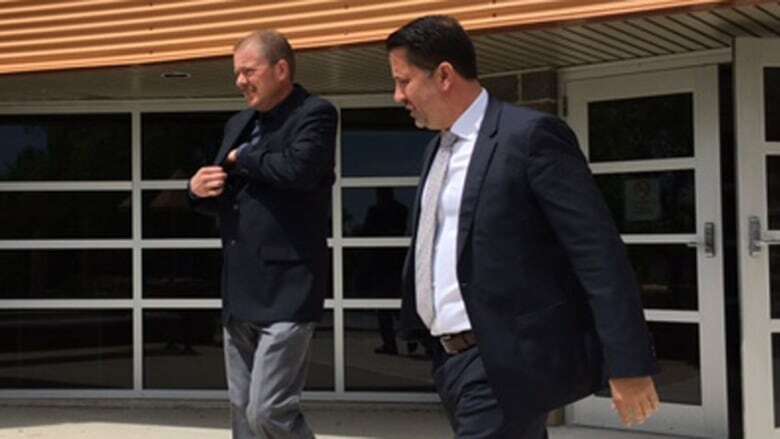 Eric Pomerleau will be sentenced Sept. 20 at 1:30 p.m.
​During the trial, the court heard Pomerleau was driving at least 72 km/h above the posted speed limit on June 4, 2016, when he crashed his cruiser. He was responding as backup to a call about a theft of baby formula on June 4, 2016. A woman studying at New Brunswick Community College was in the cruiser when it slammed into a pickup truck and then into a utility pole on King George Highway in Miramichi. Provincial court ​Judge Natalie LeBlanc delivered the verdict Wednesday. She said she had a lengthy decision but would only read portions of it. LeBlanc said police officers testified it was a routine call, and even though the suspected shoplifter was known to sometimes carry a weapon, no one else responded with lights and sirens at a high rate of speed. The court heard Pomerleau was driving 132 km/h along a stretch of the two-lane King George Highway that is zoned between 50 and 60 km/h. The judge said that after considering all aspects of the case, the time of day, the traffic and the nature of the call, she found Pomerleau's speed and acceleration a departure from the norm. Deputy Chief Brian Cummings had no comment about the verdict but confirmed Pomerleau will remain on the job until sentencing. A number of officers from the police force were in court to hear the verdict.